Each year, my family does something at this time of year…to give.? One year we bought and delivered ginerbread houses to young girls living in a group home over the holidays, another year we provided food and presents for a family who lost their home just before the holidays.? 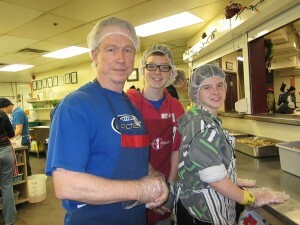 This year, we chose to volunteer at Siloam Mission.? 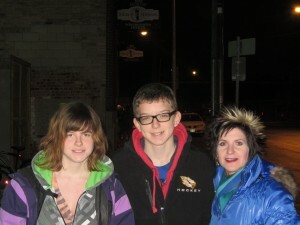 This photo is of Ali (17), Max (14) and myself just as we arrived at Siloam.? Randy took the photo (we could not quite figure out how to set the timer on our new camera to get us all in the shot!). As we approached the front door, we noticed several people lined up outside.? We kept our heads down, not feeling entirely comfortable.? This was, after all, an area of the city we rarely frequent.? ?And, we just weren’t sure about ‘things’. We entered to find the dining room already brimming with people awaiting the dinner hour.? It felt a bit strange.? We were in this new place, we made no eye contact – and neither did anyone else – as we were whisked to the volunteer area. We were met by ‘Peggy’ – one of the most lovely, inspiring, and kind people I have ever met.? She took us on a tour and explained the history and good work of Siloam Mission.? Peggy’s enthusiasm?was contagious; she kept us engaged and informed about the wonderful work?of this amazing organization. Next,?we headed to our assignments.? ?Our family was on kitchen duty.? The staff greeting us warmly, got us suited up and put us to work.? Suddenly the shutters opened, and we were off!? We formed an assembly line and, together with 3 other volunteers, served hundreds on meals over the next hour.? It was fun – and tiring! After dinner, we were on clean up duty.? I cleaned the women’s washroom, Ali and Max cleaned and stacked chairs, and Randy swept and mopped the floor.? At 9:00 p.m., we were done.? (And I mean, ‘done’!!? We were pretty pooped after the serving, wiping, sweeping and mopping!!? It was, though, that ‘good’ kind of pooped.)? We left the same way we entered – through the front door.? This time, there were many more people lined up to get their bed for the night.? As we walked out, I heard a faint ‘thank you’.? I looked up, but could not tell where it came from.? ‘You’re welcome’, I said…’and thank you!’.? As we wove our way through the crowd, 5 or 6 people thanked us, commented on the great meal they had enjoyed earlier, and wished us a Merry Christmas.? There was a lot of eye contact.? And smiling!? We now had a connection…and none of us were afraid to look at each other.? We had a ‘relationship’. On our drive home, we all reflected that…although we were in the position of giving tonight, we really received so much more than we gave.? Ali had one gentleman who thought her name was cute, and made a humourous association with it.? Max had another man who told him he was doing a great job dishing up the carrots.? Right now, I am ‘full’.? I wish you a ‘full’ holiday season too!? What a wonderful giving family, and what an amazing story…thanks so much for sharing this, Deri! Thank you, John! Happy holidays! Thank you, Darryl! It is good! Wow! Great Job! Giving and learning AWESOME!!!!! Thank you so much, Deb! It was a great experience for us all! Thanks for sharing – very inspirational. I have a friend who works there and I am going to ask him how I can sign up to do this with my husband and teenage sons. I highly recommend it, Kim! Both Ali and Max found it to be a very rewarding, eye-opening experience! Previous PostPrevious Just do it!